Looks like a squashed pumkin with a stem on top. Of course, the sunspots have disappeared since we reached a tipping point in CO2 concentration. Amazing that adaptive optics telescopes can see through the distorting atmosphere better than the Hubble telescope can see outside the atmosphere. Sunspots are on the sun, not on earth so I'm missing something. Are you saying that we can't _see_ the sunspots because of carbon footprint or that the sunspots don't _occur_ because of carbon footprint? Magnetic Destiny in our Weather Maker. If the End of the Sun is All we are able to see except at Sun Sets Green Streek of the Length of it . Our Science Rocket servay differnt that the Sun is Round like a Planet . The picture shows a distinct set of color bands...can you tell me why this occurs? Is is because of the atmosphere or something else? Additionally, the color shift looks fairly sharp, I would have thought that the color shift would have been very gradual. I was also wondering when the green flash picture was taken? The blue flash image was taken at Christmas Eve...I'm just curious to see what time of year the green flashes occur or if there is a correlation of color hue and time of year/atmosphereic change. That green flash explanation is wrong because scientist are looking at through atheistic telescopes. The right answer is that it is a Quaker colony on the sun as told by Brigham Young long ago when he said that Joseph Smith was right there are Quakers on the moon and also the sun too. So I believe completely in what religious leaders tell me without question. Therefore that is a Quaker farm on the sun. LOL@Mike! Damn my atheist telescope, and here I thought Reality was so cool! In reading my great great grandmother's diary from 1903, I noticed she wrote, "Eclipse of the sun. I seen it". She also wrote of a neighbor's also having looked at the eclipse. Later entries noted her having eye trouble and going to the doctor for "poison" to put on her eye. The neighbor was having similar problems. Grandma later went blind and never realized it was her having looked at the sun that caused her problem. Eclipse of the sun. I seen it too. But I weared protective glasses. "The sun isn't Spherical... thats true" I knew it was flat.. i just knew it. The church told me so. The Sun's rotation flattens the poles. Jupiter and the Sun revolve around a center of gravity above the Sun's surface. That causes tides on the Sun. The conveyor belt, which moves the sunspots, is another factor to consider. 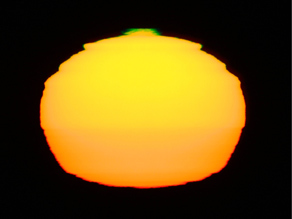 "The picture shows a distinct set of color bands"
Differential refraction, also likely similar processes as in a mirage, distorting and reflecting due to inversion layers. I wonder if in the ionosphere polarized ions contribute ? Having ALWAYS wanted to see the green flash, but living in a hilly area surrounded by trees, I have found my opportunities limited. Several years ago, though, my wife and I were having dinner on a deck overlooking the ocean in Maine. Tonight, I thought, I might see it. As the last of the sun was approaching the horizon, my wife said something to me, and I turned my head to reply and to take a (thoughtless) bite of my crab cake. At that moment I heard people exclaim, "Did you see it! Did you see the green flash?" No, I don't blame my wife. I blame my STUPID STUPID INATTENTION!! AAAUUUGHHH!!!! Yikes, hope it was a good crab cake Mike (although if you were in Maine, I would have suggested lobster!). I have been fortunate to see the flash numerous times. The most amazing was when I was flying into the sunset on my way to Guam, at FL310 with a C-5 on the boom. Almost forgot what we were doing there for a moment!